Dr. Byron W. Wall is a leading dentist based in Albuquerque. He offers patients the latest in advanced restorative dentistry treatments for the teeth and gums, which helps people have smiles that are healthy as well as beautiful. When it comes to chipped teeth, Dr. Wall has a number of options for treatment. Let's take a moment to consider some of the different treatment options for chipped teeth. If you have teeth that are chipped or cracked, it can have a negative impact on the overall look of your smile. Even a minor chip can draw major attention to itself, causing an otherwise great smile to look imperfect. This can lead to self-consciousness when laughing, smiling, or speaking, even around people that you've known for ages. Chipped teeth aren't just a cosmetic issue. Many times people who have chipped teeth also experience issues with their overall dental health. These problems may include issues with dental alignment, problems with tooth pain or sensitivity, or even issues with the effectiveness of their bite. All of these health issues are significant and should be addressed through proper dental care. For very small chips that are purely aesthetic in nature, the best overall treatment option to consider is dental bonding. Dental bonding involves the use of a tooth-colored resin that's painted directly onto the tooth's surface. This dental resin builds up the missing tooth structure, helping your smile look its absolute best. When a chip is too serious to be treated through the use of dental bonding, another cosmetic dentistry option to consider is a porcelain veneer. Porcelain veneers are thin shells of dental ceramic that are used to mask imperfections and flaws from view. Porcelain veneers are also good treatment options for major dental stains, general tooth discoloration, minor misalignments, and small gaps between teeth. When a chip results in structural damage to a tooth, inlays and onlays are ideal dental restorations to consider. Inlays and onlays are designed to replace larger sections of damaged tooth structure, even the entire biting surface (cusp) of a tooth. Tooth-colored inlays and onlays as well as metal inlays and onlays are available. The ideal option will typically depend on the location of the tooth in the mouth. When a tooth is too severely damaged to be properly treated with an inlay or onlay, the last option for saving the tooth is a dental crown. Dental crowns are caps that fit directly over a tooth that's been damaged or decayed. 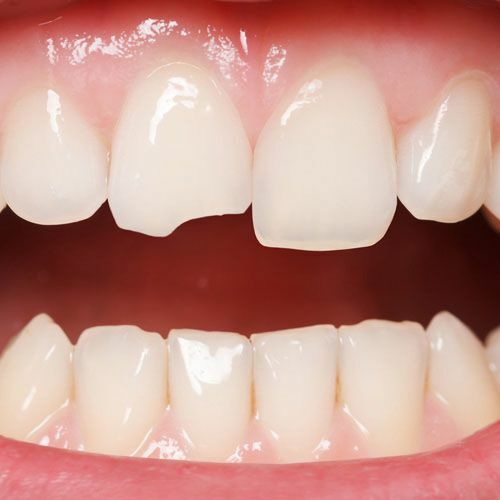 When in place, a cap protects the tooth from further harm and prevents issues with pain and discomfort in the process. As with inlays and onlays, metal and tooth-colored crowns can be used. To learn more about your many different treatment options for chipped and cracked teeth, we encourage you to contact our cosmetic and restorative dentistry center today. Dr. Byron W. Wall and his team will help you achieve the best possible dental health as well as a beautiful smile.